England's Nick Matthew and world number one Ramy Ashour remain on track to meet in the semi-finals after reaching the last eight of the World Championship. Matthew, seeking his third world title, beat Omar Mosaad of Egypt 11-4 11-7 11-13 11-4 in the last 16 in Manchester. 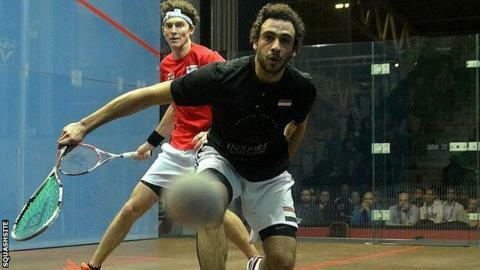 Egypt's Ashour, the defending champion, then beat Australian 14th seed Cameron Pilley 9-11 11-8 11-4 12-10. Third seed James Willstrop of England and French second seed Gregory Gaultier also advanced. Ashour, who won the first of his two world titles in Manchester five years ago, dropped the opening game for the second time this week but recovered to extend his unbeaten run to 48 matches on tour and 52 in total. He will next face unseeded Saurav Ghosal, who fought back to beat Finland's Henrik Mustonen 5-11 8-11 11-8 11-4 11-2 and become the first Indian ever to reach the last eight. "Personally for me it's a massive achievement," said Ghosal. "I hope this will be a big boost for the game in India - making it to the latter stages of this competition is a big achievement. "I hope that it will get some recognition back home; not for me, but because it would be great to get more kids playing the game." Matthew, 33, faces a tough test in the quarter-finals against four-time world champion Amr Shabana of Egypt, who beat Colombian Miguel Angel Rodriguez 11-6 11-5 11-9. "Before I can even think about playing Ramy, there are a few more challenges to face before that match - a man that's got a few world titles under his belt," said Matthew. Willstrop, who is travelling to and from his Harrogate home daily as his partner Vanessa Atkinson is overdue with their baby boy, beat ninth seed Borja Golan from Spain 11-4 11-8 11-6. Willstrop next plays Mohammed El Shorbagy, the Bristol-based Egyptian who upset him when he was top seed in the World Championships in Doha last year. Gaultier defeated Egypt's Tarek Momen 11-5 11-6 11-6 and will play England's Daryl Selby after the 13th seed beat the fifth seed and former world number one from Egypt Karim Darwish 4-11 11-9 12-10 8-11 11-8. The tournament moves across the city on Thursday from the National Squash Centre to the larger Manchester Central venue. Coverage on the BBC from the quarter-finals onwards. Thursday - live on connected TV and online from 19:00-22:00 GMT and delayed coverage on Red Button 21:30-00:30 GMT. Friday - live on connected TV and online from 19:00-22:00 GMT and delayed coverage on Red Button 22:00-01:00 GMT. Saturday - 16:00-20:00 GMT connected TV and online and delayed Red Button coverage 22:35-23:35 GMT. Sunday - 17:30-19:30 GMT Red Button and online - live coverage of the final.